Here are a few sneak peeks of the pop-up card with colors. This is the card totally open and when you see the Ironman mask in total and closed. This is what you see while opening you still see the face underneath. My battery ran out today so have to film it tommorrow also will updat the mask a bit to get the shape more correct. However I will introduce the contest right now. 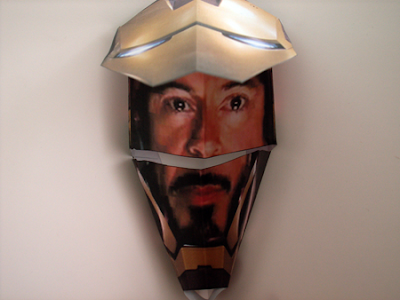 I will be starting a contest where people could design a pop-up card with the same design as this Ironman pop-up card but for something else. Something with a double face or for a masquerade party. All entries will be displayed on a special blog and the winner will win a special goodie bag with a set of 12 Copic markers and more. 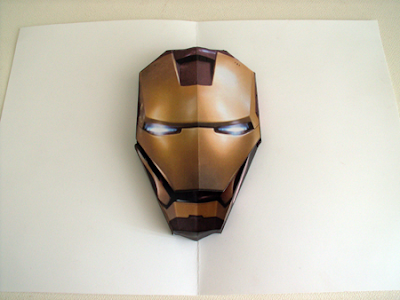 Further information about this contest will be placed on the next post of the final Ironman pop-up maskcard.